I resolve to post at least once each month on my works in progress and finished pieces. That said, I'd like to share a project in progress... the Thick and Thin Leaf Lace Cowl from Vogue Knitting magazine, Early Fall 2013. I've made several changes. First, I won't finish this piece as a cowl. Instead, I'll have it blocked to approx 14x70 for a shawl. Second, I've substituted 8^ beads for the second yarn, placing each bead with a crochet hook on the purl side of the shawl above each decrease, both single and double. I used the yarn specified in the pattern, Prism's hand-dyed Gossamer Layers, in the Jade colorway. Desert Design Knitz in Dallas was my yarn source. Ellen was a great help. I ordered the yarn from her and it arrived in three days. On a trip to Dallas in October 2013 I had time to visit her shop (and buy more yarn!) She is quite knowledgeable. This yarn is very similar to several yarns I already have in stock, though I don't carry it in emerald green. I'll definitely make this project again, but in one of our own yarns. Anyway, I started this project on November 16 at the urging of a good friend, Rebecca, who wanted me to teach her how to do it and to help with any problems. On January 9th I finished my shawl; Rebecca is on Row 8. She started at the same time but put it aside to make several last-minute Christmas gifts. She picked it up again last week and I suspect I'll see her often in the next few weeks. 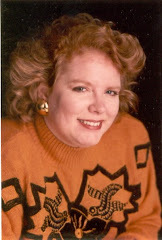 This week I'll take my shawl to Vickie to block. She does a fabulous job, charges a pittance, and works in the ends. I'll upload a photo of the finished shawl but, in the meantime, this photo is of it in progress...aboard the Royal Princess while anchored off the island of Eleuthera in the Bahama. Wow. I can't believe it's been over two years since I posted on this blog! Shame on me! Well, the past two years have been quite busy (not an excuse, just fact.) Just since the first of June I've had Mother (83) at the emergency room twice and at the doctor's office for tests or blood work six times since; and I'm in the process of moving the entire contents of The Busy Needle to the online store. At the moment I'm working on Americano, a vest in Berroco's new Vintage Chunky. 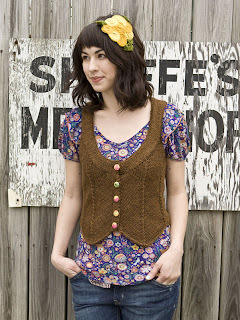 The pattern is published in Berroco book 203, released for the Fall 2010 season. I've selected a lovely orangey-rust color. I started this on Sunday, put about 2 hours per day on it, and already have the back and left front finished. Right now I'm working my way up the skinny pieces (over the shoulder) on the yoke and expect to finish that tonight or tomorrow morning. If the right front goes as quickly as the left front did, I should have this ready to block and put together this weekend. It has gone far more quickly than I anticipated. The Berroco Vintage Chunky yarn (at 14 sts in 4") is soft and a bit drapey; lovely to work with. The vest, however, is VERY fitted, with 2+ inches of NEGATIVE ease. Most of the women who will be taking the Americano Vest class on October 2nd don't like close fitting clothing. (We aren't ALL a size 2!) So I'm making this vest in the Size 42 (the sizing goes from 30"-50" and this is the Women's Large size) so the class members can try it on and see how they like the fit. If it's too tight for them, I'll recommend going up a size (or two) to fit their body circumference, but using the length for their correct size. We're definitely going to be changing the cast on edge. Even correctly blocked it rolls upward because of the negative ease. When I get this vest put together I'll post a photo. Must find some fabulous buttons for it! The new Berroco Women's Sweater show has arrived at the shop and they're gorgeous! The creative geniuses in Massachusetts have knit this fall's Men's Sweaters in ladies' colors and I think they're even more fabulous than the Men's Trunk Show sweaters. They'll only be here until Saturday afternoon, when they get packed up and shipped off to another shop, so you'll have to drop by soon to get a quick peek at them! The Busy Needle will be closed on Thanksgiving Friday so I can have some "quality time" with my oldest son, Gavin. I'll reopen again on Saturday morning - 1o-ish! Have a great Thanksgiving and a wonderful time shopping on Black Friday! Okay, okay.... I'm working on the July-August class schedule as fast as a I can! Hopefully I'll have it posted by Monday, July 13. I promise I'll send out an email as soon as it posts. Children's Hats - They make great Christmas presents and we have a new teacher who has made dozens of cute designs from one basic pattern. Lace Shawl - That new merino/silk blend yarn will be featured in this class. Only two skeins needed for this project! I'm working on the model as fast as I can! Hardanger II - Bookmarks or Christmas ornaments? Jackie has the bookmark model done, but we have a customer who wants to do Hardanger Christmas ornaments. Which would YOU prefer? Coming in September - A Man's Sweater - Great for Christmas, and you have time to get this one done! Coming in October (we hope!) - The Norah Gaughan Collection from Volume 3 - including the Eastlake sweater on which we'll do a class in November, and the Violette-le-duc Sweater shown on the cover. Can't wait to finalize the details with Berroco! Berroco did call me back yesterday, as promised. And they've already posted the sweater corrections on the website. Second - You do, indeed, change to the larger size needles when you are ready for the first (ws) decrease row. If you are in gauge, this should be immediately after the seventh leaf pattern row. While the number of stitches to decrease on each side of the leaf pattern still bothers me (approx 15% on the larger front side, but approx 30% on the smaller), I'm just going to let that one go. I did talk to Berroco again this morning, however. Decreasing while ribbing just doesn't work. The ribbing gets screwed up and there's no way to keep it in pattern. This ws decrease row on the larger needles needs to be purled on either side of the leaf pattern. By doing it this way, it will also agree with the back when you go to sew the side seams. (Just remember to follow the pattern directions for continuing the ribbing at the sides of the leaf pattern during this row. Don't forget to put in the additional markers.) Then it works!